ID quizzes and challenges seem to have become an increasingly popular subject for natural history blogs. I’ve done a few of my own, but my straight up ID challenges are starting to seem a little unimaginative compared to the DNA sequence, crypsis, mimicry, taxonomy fail, and other challenges being offered up by bug blogdom’s more creative types. To step it up a notch, I offer the first Super Crop Challenge. Small structures that we take for granted within a larger context often take on alien qualities when viewed in isolation. Can you identify this structure and the organism that possesses it? Can I identify it? No. But I look forward to following the challenges. Good idea, Ted! 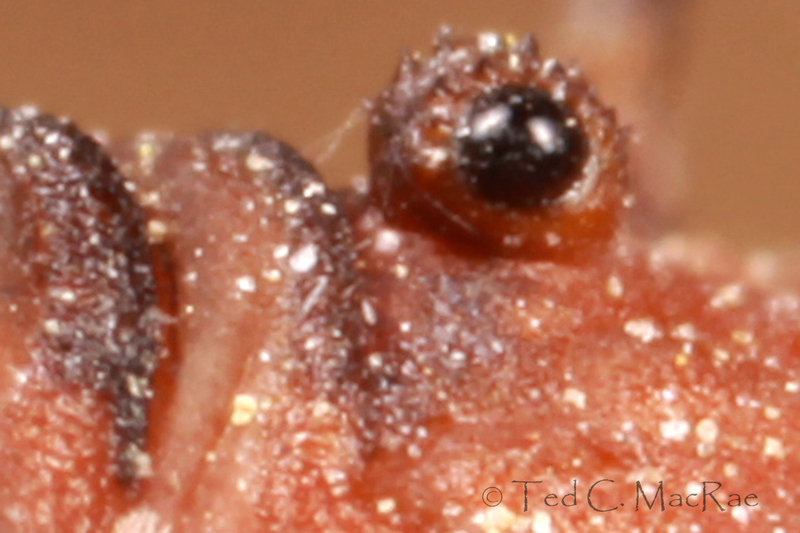 It’s the eye of a harvestman. Sorry – somehow the “Allow Comments” box got unchecked. Anyway, a couple of solid answers. However, without revealing too much I’ll say that there are plenty of points up for grabs! But, clearly, it’s actually a partially submerged hippopotamus in profile. Or else one of those weird flat fish. I’m going to cast my vote with you for hippopotamus. Definitely a leiobunine. The coloration and texture looks wrong for a phalangiid, which are generally duller-coloured and leathery rather than crunchy. Maybe Leiobunum verrucosum, but I wouldn’t want to commit to that one.